Approx dimensions: Height 105cm – Width 90cm at the widest point. 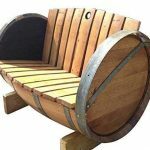 This lovely solid oak whisky barrel Budweiser branded patio table is made from barrels that have been used in some of Scotland’s finest distilleries. 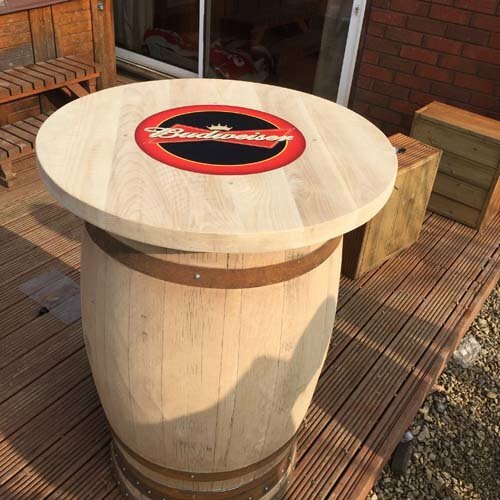 The barrel has been refurbished and staves have been used to create table top, the Budweiser transfer is then applied. The whole unit is sanded back to give an aged oak look and is varnished making suitable for indoor or outdoor use. 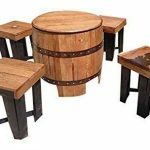 This table would at home on any patio or in any beer garden.